Euryops, yellow bush daisy, or African Yellow Daisy is a marvelous addition to any garden that has a well-drained, full sun situation. 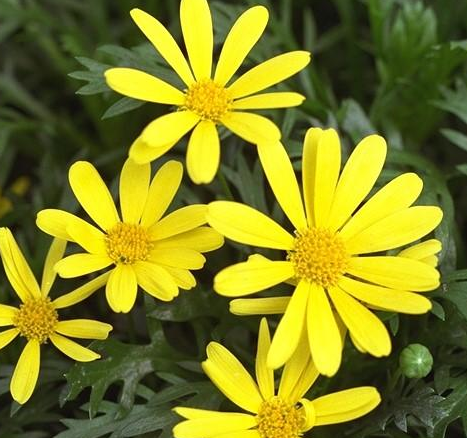 This is a plant that provides sunny, yellow daisy-like flower color against a mat of appealing finely cut green foliage all season long. It is a tough plant that survives all but the most extreme warm weather conditions including moderate drought. Grows 14-18” tall. Not cold hardy.